A dripping faucet can be a real hassle, especially when you don’t know what to do. Imagine, one random Saturday morning you get up and head downstairs to get your morning coffee. The sun is shining, the air is crisp, and the world is a happy place as you step outside to get your morning paper. As you head back inside to sit down with the sports page and a plate of sausage links and eggs you hear something, a quiet dripping sound, that is coming from the front of the porch. You investigate because what else have you got to do on a Saturday morning, only to find that your outdoor faucet has a drip. This isn’t morning dew, or a little leftover water from the last time it was used, however, this is a steady drip, and it’s pretty significant. Soon you start to worry about all the bad things that can come from this, damage to your lawn, damage to your house, the death of your prized azaleas that are adjacent to the faucet, a water bill that could send you to bankruptcy court. OK, so maybe you’re overreacting a bit, but one thing is for sure, you need to get this drip fixed right now, there isn’t a minute to waste. The only problem is that you have no clue whatsoever where to start. 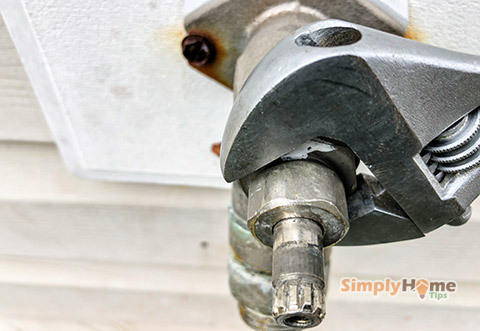 Fixing a dripping outdoor faucet is actually pretty easy, in fact, even the most novice of homeowner can tackle this common home improvement task easily with a few basic hand tools, and a quick trip to their favorite home improvement warehouse or local hardware store. 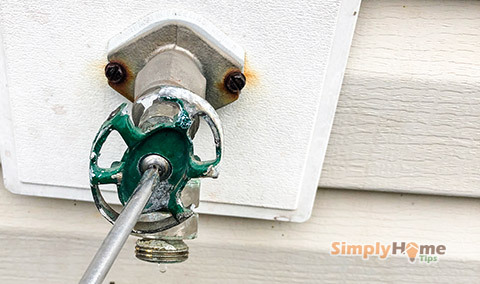 Let’s look at a few options to fix your leaking outdoor faucet. Where for Art Thou Leak Location! To check to see if the leak is coming from the handle take a standard pipe wrench and carefully try to tighten the packing nut. For those who don’t know what a packing nut is, and that would more than likely be just about everyone who is not an avid plumbing hardware enthusiast, that’s the big round smooth thing directly behind the handle. Many times the freezing and thawing process of winter will loosen the nut a bit, and that can cause a steady drip leak. 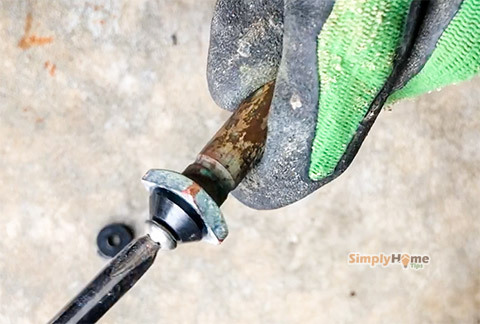 If after you tighten the nut (remember left loosey, righty tighty) the leak is not stopped, or if the nut is already tightened down, then you will need to move to the next possibility the leak is coming from inside the spout. 1. SHUT OFF THE WATER! Failure to do this will lead to a very Three Stooges’esq sight to behold. The valve to turn off the water supply to the outdoor faucet is often located in the basement or in the home’s crawlspace. If you don’t find it, it may be under the porch behind an access panel (oh fun, right!) but this is usually only on much older homes. In some cases, there may be one master valve for all of the outdoor water features of your home. 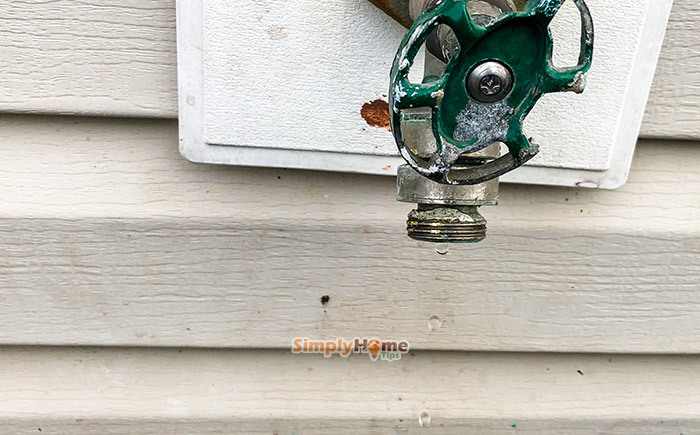 In the very rare case that you live in a place (usually the south or in some parts of the southwest) where there is no code requirement for the outdoor features to have a separate cutoff valves, you will need to turn the water off to your home at the master valve located in the basement or possibly at the water meter at the street curb. 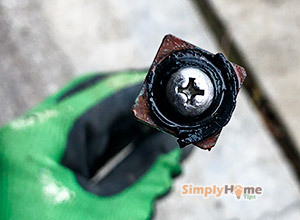 In most cases, a simple Philips head screw holds the handle in place, but in some instances, you may need a star head screwdriver, hex head screwdriver, or even a small socket wrench to remove a threaded bolt. Ahh, yes, our old friend the packing nut is back and better than ever. Use a pipe wrench to undo the packing nut by turning it counter clockwise (lefty loosey). Once the packing but is out loose you can remove the valve stem assembly. 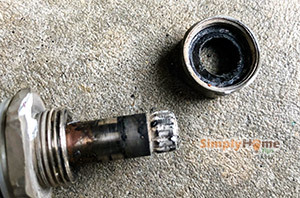 The valve stem assembly should just easily slide out of the faucet head with a gentle pull. In some very rare cases, you will have to further unscrew it out of a seating with your fingers but it’s not tightened in so you should have no problems. 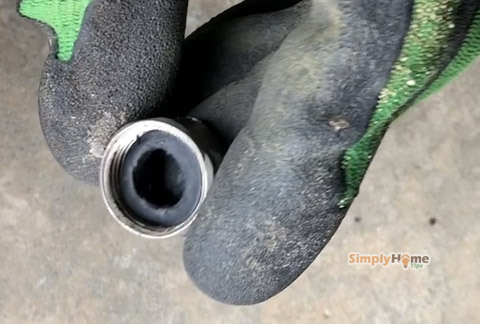 No, we’re not talking about if it’s time to throw your socks and tighty-whities in for a quick rinse, we’re talking about the arrangement of the rubber washers on the valve stem assembly. Some older designs will have two washers, one behind the packing nut and one at the base of the valve stem assembly. Other units will only have one washer to deal with. Tip: you can bring the whole stem to local hardware store to match the exact replacement. This washer is located directly behind the packing nut, and may not be in place on all models. The washer will just pop out once you have the packing nut connection out of the way (it just unscrews with your hands). Take it to the hardware store and get one that is identical and pop it back into place before putting the packing nut connection back into place. This washer is on all models and is located at the base of the valve stem unit. It is held in place in most cases with a simple Philips head screw, but it may be a star head, or hex head screw as well. Once the screw is out of the way, just take the washer off and take it to the hardware store to get a new one. Make sure that it is identical and put it back in place, reattaching the screw that holds it. This is as simple as placing the assembly back into the faucet and seating it in place. Only tighten to hand tight no more. 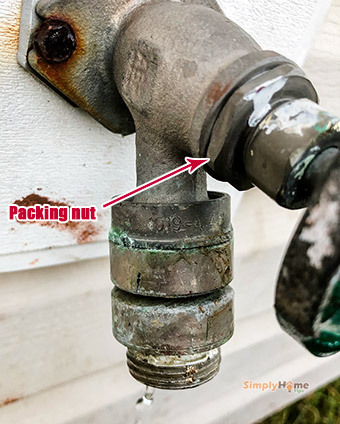 Retighten the packing nut with a pipe wrench clockwise (righty tighty) until it is fully tight, but be careful not to tighten too much and potentially damage the packing but or the faucet itself. Attach the handle back to the faucet using the same screw that you took off (unless it is worn and then replace it please to make life easier in the future). Make sure that you tighten it down well, but not too tight to prevent damage. Turn the water back on and have someone check for leaks or drips around the assembly to make sure that everything is reassembled as it should be. Turn on the faucet and allow it to run for several moments at full power and then turn it back off, wait a few minutes and then check the faucet. The leak should now be fixed. If you have an older “single handle” or “compound valve” design faucet which was common from the early 1940s to the mid-1970s, then you will need to replace the entire faucet in most cases. This is not a massively more difficult project, and does not involve any more advanced skills than what we have used here. 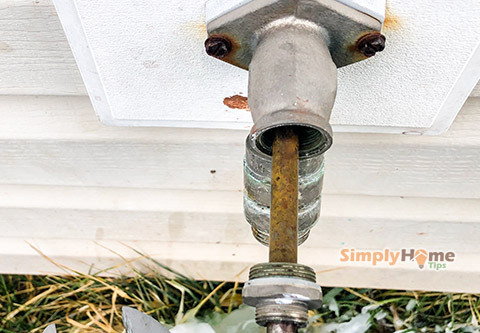 These simple steps can help you to repair a dripping outdoor faucet yourself, and not only prevent damage to your home and lawn, but also avoid costly water bills, and even more costly plumber repair bills. This is a simple project that any homeowner can do themselves quickly and easily using simple hand tools and basic skills. Believe it or not, you can do this. Good luck!